While a credit score offers a high-level overview of your current financial standing, a credit report offers an in-depth look at your lending history. At the very least, it is important to read through your credit report once a year in order to stay on top of any inaccurate, outdated or missing information. If you are planning on taking out a loan, applying for a new credit card or leasing a vehicle, your credit report will point out any issues that might need to be fixed before creditors take a thorough look into your profile. Although Equifax, Experian and TransUnion may display some information differently, all providers are required to provide the same updated credit history. Some sections may not be displayed in your credit report if you do not have anything in your lending history that would fall under the section. The first section in your credit report is your personal information, which includes your full name, address, date of birth, Social Security number, phone number and any employment information. Not all companies report employment information to credit bureaus, especially if you do not work at a financial institution or have a company credit card. Personal information is updated by data provided by creditors and information you provide. Although this section does not factor into your overall credit score it is important to review it for accuracy. Inaccurate information in this section can be a sign that some applications were reported in error or that fraudulent accounts were opened under your name. If you notice any of the following red flags, it is important to submit a dispute seeking out additional information. If any information does not look correct on the credit reporting agency’s end they may have an additional note or notice in the section displaying an issue. Although not all issues with the personal information listed on your credit report are crucial, it is still important to contact the bureau to make any fixes. If you have multiple names listed it could be a sign that someone is applying for lines of credit using portions of your personal information. Some spelling errors, abbreviations and nicknames may also show up on your credit report through clerical errors, but it is still important to amend these discrepancies. Fraudulent accounts may be tied to a separate address in order to redirect mail and important documents away from you. If you notice an address on your credit report that you have not lived at it is crucial to contact the credit reporting agency for more information regarding accounts tied to that address. As a way to forward any calls linked to fraudulent accounts, scammers offer separate phone numbers to creditors. Although some numbers may be entered in error, it is important to make sure your main contact number is correct. The account section of your credit report will display all your accounts and lines of credit, including credit cards, retail cards, installment loans, real estate loans and student loans. 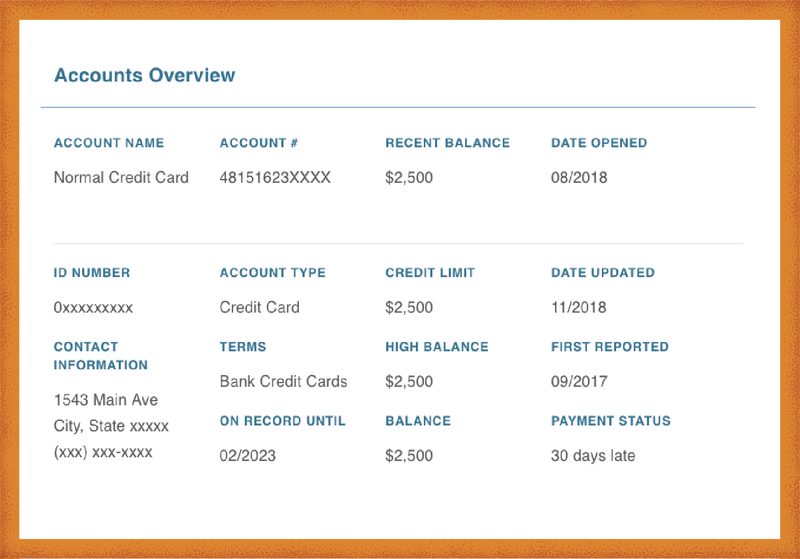 The accounts section is broken into open and closed accounts and will only display the sections that have information tied to your credit history. Your open accounts will display all active lines of credits that you are currently using or still paying off. Each account will contain additional information on payment history, balances, credit limits and any negative items like late payments, total debts or missing payments. Although it may not be clearly labeled on your credit report, late payments, your credit utilization and payment history are all major factors in calculating your credit score. If you see any issues in this section that you have already amended with your creditor it is worth issuing a dispute with the credit agency. Your closed accounts will contain similar information to your open accounts, including payment history, amount owed and overall payments. This section will also contain a citation for why the account was closed. Some account closures, such as paying off a loan or mortgage on time, are straightforward but other reasons could be a negative mark on your credit report. Account closures caused by account inactivity, payment delinquency or even a canceled card can all negatively impact your credit score. It is important to go through your accounts to check for any issues that could be harming your credit score and any signs of fraud. If you notice any accounts you do not recall on either your open or closed accounts overviews you should contact the creditor for more information regarding the line of credit. Before issuing a dispute with the credit agency you should acquire any information about the account for legal uses. Occasionally charges or account totals can be reported in error or fraudulently, making it a good practice to check through when reviewing your overall payment history with a creditor. Some credit card payment information could be reported before charges were removed or refunded in your account. If charge numbers vary largely they can impact your overall credit utilization, which weighs into your overall credit score. Late payments count as a negative mark on your credit score and make you a higher risk when you’re being considered for new lines of credit. If you have missed or been late on a payment, it is important to always call your creditor asking for any forgiveness of charges or fees. If you have paid any delinquent or late debts it might be worthwhile to send a good faith removal letter to the creditor. Removing late payments and debts is not built into most credit reporting agencies dispute systems so the letters should be sent to the creditors independently. Public records cover information gathered from courts or other government agencies about legal matters associated with you. The most common public records are bankruptcies, tax liens and monetary judgments. Depending on the type of public record or judgment, the information outlined may stay on your credit for 7–10 years. It is important to note only public records pertaining to financial issues will be reported in your credit history so any other legal proceedings will not be listed in this section. If you have any public records listed on your credit report it is important to thoroughly check though the section for errors or inconsistencies. How Long Has the Negative Item Been on Your Credit History? Some financial judgments will stay effective on your credit report for 7–10 years. However, it is important to keep track of the elapsed time between when the judgment was first reported. After the minimum required time for reporting has elapsed you may need to issue a dispute to seek removal from your credit report. Are Any Negative Items Reported in Error? Some negative judgments could be reported in error such as delinquent accounts that have since been paid off or collections that have been amended or paid in full. If you are unsure why a particular judgment is on your report, it is best to first contact the creditor to ask why it is being reported. Hard and soft credit inquiries are listed on your credit report and give you a good idea at what creditors are viewing your credit report. Soft inquiries will not affect your overall credit score, but hard inquiries are counted as a negative item. 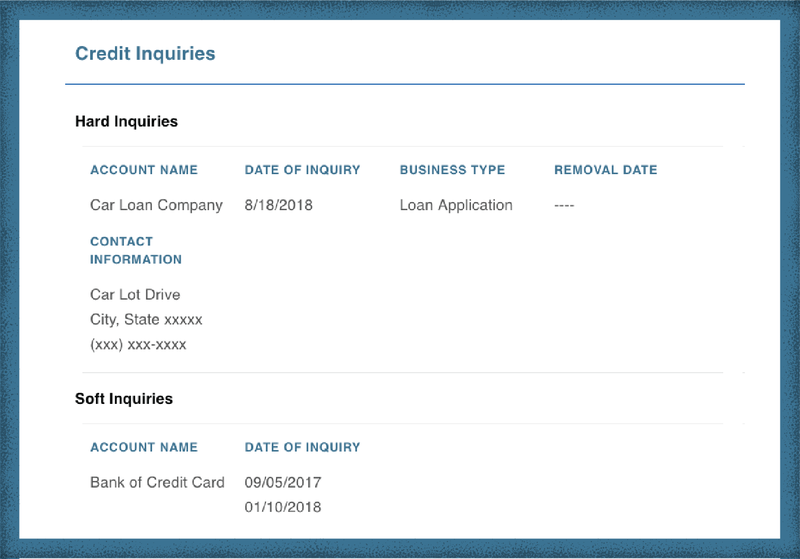 Soft inquiries include times you have viewed your own credit report and instances where creditors have viewed your report outside of the credit application process. Soft inquiries should not be too alarming nor do they need to be removed or disputed because they do not count toward your overall credit score. Checking through your soft inquiries will give you a better idea of who is looking at your credit score and credit reports. Often creditors will view your credit report as part of their qualification process when sending you advertisements or applications to different credit cards, loans or lines of credit. Hard inquiries are signs of more thorough credit checks and hard pulls conducted mostly by creditors as part as their application process. If you have applied for a loan, car financing, a mortgage or any line of credit the inquiry will be listed as a hard pull. Hard inquiries should be checked thoroughly for any issues regarding the number of inquiries filed by a creditor and for unknown inquiries, as these will weigh toward your overall credit score. If you have credit inquiries listed on your report you should check through the entries checking for any issues or inquiries you do not recognize. If you find any off the below issues on your credit report, you may be able to submit a hard inquiry removal letter to the creditor or the credit bureau. Did You Approve the Creditor to Access Your Credit Report? Some hard inquiries are filed in error and others could be signs of fraudulent accounts or application processes. If you do not recognize the creditor who filed the inquiry it is best to dispute the instance and ask for its removal. Hard inquiries will affect your credit score for two years, making it important to report any issues even months after the inquiry occurred. Are There Multiple Hard Inquiries From the Same Creditor? Occasionally the same creditor might submit a hard pull for your credit multiple times during an application process. Even if you approved the original inquiry, if the creditor was not upfront about the number of hard credit pulls you may ask for its removal. Annualcreditreport.com is an online portal that offers free access to your credit report from the major reporting agencies. Equifax, Experian and TransUnion are required by the Fair Credit Reporting Act to offer every American free access to their credit report once every 12 months. Since each credit report offered by the three credit reporting agencies contains the same information, you can spread out your free access by rotating through the different reports every four months. To access your credit report online you will need to provide some personal identifying information including your Social Security number, current address and date of birth. You may also have to answer additional questions regarding recent transactions, lines of credit or applications to prove your identity. Knowing how to read through your credit report correctly will help you spot any signs of identity theft before the problem grows. Being able to identify any negative items yourself will also help you when assessing the areas you need to improve or entries you need to remove.